Join us in our biggest block exchange ever and make this amazing quilt from Pam Buda in the process! The Circa 1880 Nine Patch quilt is a jaw-dropping beauty of Civil War Reproduction Fabric scrappiness. 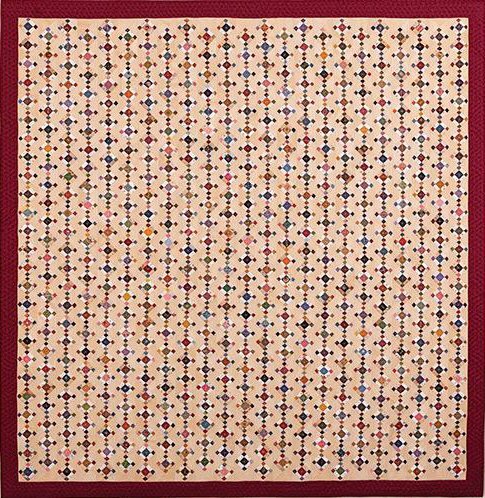 Made up of over five-hundred 2” finished blocks, the quilt is a replica of a circa 1880 antique quilt that Pam fell madly in love with. Once she started making the blocks, Pam realized that exchanging blocks with friends would make the process quicker and she’d end up with a scrappier quilt. Join us, Friends, in exchanging these adorable blocks and make your own heirloom quilt. Sign up for this year long BOM and we will send you an “Exchange Starter Pack” in January to get started. This will include the pattern, the two templates you will need, six 5” x 22” strips of fabric (three lights and three darks) and directions on how to exchange. Each month after that, we will send you six more unique 5” x 22” strips of Civil War Reproduction fabrics that you can use in your blocks along with what you pull from your own stash. You will need to add from your own stash to make the entire quilt but that is part of the fun! In month 6, we will also send you four yards of setting fabric so that you can start putting the rows together. Make as many blocks as you want each month and bring (or mail) in when you are ready. Starting in February, we will return to you the same number of blocks that you turned in. We will continue to trade blocks until the end of the year at which point we will be ready to put our quilts together! To kick off the exchange, we’ll have a free demo in January for local customers to attend. Mail order customers are also welcome to participate! Finished quilt is 72” x 78”. Sign Up Fee – $ 40 for an Exchange Starter Pack which includes the pattern, templates and six 5” x 22” fabric strips. Monthly Fee for Months 2-12 - $ 12.99 per month. Mail order is available for an additional shipping fee of $ 4.99 per month.